DN! in Maine Now - NEW! Sister DN! Campaigns - NEW! Maine Campaign News - NEW! MPR Pledge Refusal Flyer - NEW! 3,000+ Requests for Democracy Now! Click here for text and see Update below. 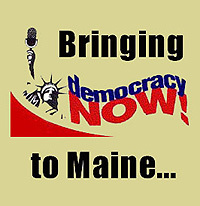 VOTE WITH YOUR DOLLARS FOR DEMOCRACY NOW! Coincidentally, Maine Public Radio is also in great need, only theirs is for Pledge Revenue Now! MPR is in desperate financial trouble and has to raise a quarter of a million dollars during this pledge week. Hmmm, maybe we can work something out... Since courtesy, reason and widespread support have so far failed, let us now try the coarser tools of economics. FLOOD MPR's PLEDGE DRIVE WITH DEMANDS FOR DEMOCRACY NOW! Call in to the MPR Pledge Line (1-800-866-1475) from April 5th to 11th and tell them you would gladly support them, but ONLY IF they carry Democracy Now! (for at least a 3-month trial). If you are not yet an MPR member, tell them you would happily become one IF they agree to this trial and that you will send your pledge as soon as it is on the air. If you are a member, tell them that you will withhold your dues and forego new pledges UNTIL they agree to give the show a fair trial, and that you will not resume support until it is finally aired. Contact EVERYONE you know who might by sympathetic and ask them to call in to the MPR pledge line (1-800-866-1475) during this drive and agitate for a three-month trial of Democracy Now! Economic pressure may not be noblest path to success, but all is fair in love and war, and here we're definitely moved by both. a number of public spirited citizens have already offered over $5,000 in fiscal sponsorship, underwriting support, and supplementary aid if MPR takes the program. Let's deluge them with calls, insist on a trial, and then "Let the People Decide!" NOW MORE THAN EVER, YOUR HELP IS NEEDED! PUT THE PUBLIC BACK IN PUBLIC RADIO! 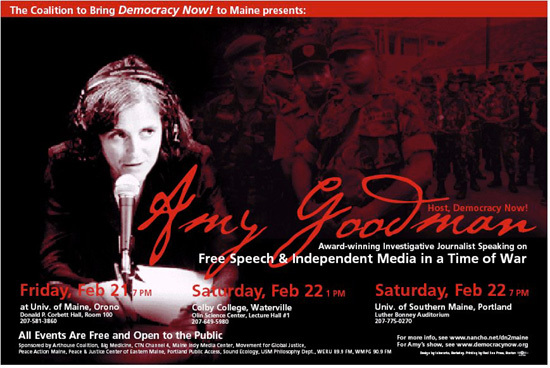 UPDATE: First off, we would like to warmly thank the thousand+ of you who attended Amy Goodman's presentations in February despite the ferocious weather, and the thousands more who have written, emailed and called Maine Public Radio in support of this cause. Maine's response to the first two phases of this effort (enlisting organizational endorsements and demonstrating wide popular support) has been massive and unprecedented. and, perhaps most importantly, despite the Supreme Court's "Fairness Doctrine" ruling that declared the First Amendment "rests on the assumption that the widest possible dissemination of information from diverse and antagonistic sources is essential to the welfare of the public.."
Despite all this, Mr. Beck finally told us last week to forget it and go away. The apparent gist: "We don't care about your support, we don't need more diversity, and we don't give a damn about the thousands who promise to become new members if Democracy Now! is tried on the air. We shall decide what the public will hear and the public will kindly shut up." Beck went on to make the rather stupefying claim that Amy Goodman, who has won nearly every broadcast journalism award in America, is merely a leftist version of Rush Limbaugh, the hate-mongering attack dog of the right. (The degree to which this decision is based on his personal politics or fear of reprisals from his government and corporate funders is still unknown, but we do know his arguments for refusing the show are clearly pretexts and ring untrue. A brief examination of his official "reasons" (and our comments) are available here. Portland - WMPG (90.9 FM and 104.1 FM) beginning April 14. Blue Hill - WERU (89.9 FM). Weekdays at 5 p.m. Weekdays (except Wednesdays) at 9 a.m.
Get Democracy Now! onto Maine Public Radio as a daily news program by March 2003 (at the latest). the racial bias apparent in the "War on Drugs", the "War on Terror", urban policing, and application of the death penalty. Democracy Now! also offers in-depth interviews with insightful but media-shunned figures like Michael Moore, Greg Palast, Noam Chomsky, Jim Hightower, Cornell West, Edward Said, Ani Difranco, et al. If you have never experienced the program, you can get a fast impressive taste at the DN! website: http://www.democracynow.org. We ask you to imagine how the topics DN! covers, the voices it features, and the dissenting views it offers could dramatically change the local psychic atmosphere. In sum, we believe that regular broadcast of Democracy Now! in Maine could open a major clearing in the propaganda fog around us, and revitalize citizen activism and democratic debate across the state. Note: We conferred with Mr. Beck himself about this request a couple weeks back, and he said carrying Democracy Now! was doable in theory but we might meet resistance from current program fans. Many in this crowd are also MEPR "members" and contributors, he noted, so they have a bit of clout. Therefore we would have to demonstrate "a LOT" of popular support for DN! inclusion to make the potential aggravation worthwhile. So that is the political terrain we face, and we propose to cover it in two steps. First we gather up a decent number of eminent organizational endorsements for the enclosed Appeal Letter and present that document personally (with 15-20 supporters) to Mr. Beck's office in Bangor sometime before the MPBC Executive Committee meeting on February 11th. After the Appeal is presented, we launch an email/fax/phone blitz to MPBC from around the state. We'll of course be inviting members from endorsing groups to help out, but also hope you ask friends, relatives, and work mates to drag their personal networks into action, too. We also encourage letters to the editor and op-ed pieces for local papers (and will be offering useful samples on this site). With a little work and clever effort, we should have an absolutely irrefusable pile of pleas in the MPBC Board's inbox. As an added sweetener, Democracy Now! has offered Maine their first six months of programs absolutely free, so MPBC could assess listener response before having to think about money at all. If public reaction is as vibrant here as it has proved in other states, there should be no difficulty in finding local underwriters (public radio-speak for "sponsors") to cover the show's extremely down-market cost. First off, get inspired. Just imagine the difference this could make - a full hour of real non-corporate news and propaganda-deflating truths available every day in every home in the state. Then if you can help sign up a group or association to the Appeal Letter, PLEASE do so immediately and send us a note (at bigmed@nancho.net)on the details -- group name, focus, contact person, contact info, etc. Also if you know anyone on the MPBC Board (or someone who knows someone on the board), please begin lobbying at your own chosen speed. Write pro-DN! editor letters or op-ed pieces to local publications encouraging others to get involved. Beg, borrow or buy copies of DN! videos to turn on colleagues and friends. Grab a phone and become an ad hoc telemarketer for Truth, Justice & the emperiled American way. Burn CDs of compelling shows from the Democracy Now! program archives and pass them around to truth-starved, tech-challenged friends. Cruise the Democracy Now! site, review our proposed plan, and imagine how this campaign might work better. Then contact us with your artful suggestions and/or go out and field test them on your own. Drop a check or loose change on our chief spear carrier, Bob Walters (15 Leeside Rd, Harpswell, ME 04079), who has selflessly led this effort (out of pocket) from day one. New! Free speech-loving donors can now make fully tax-deductible contributions by addressing their checks to Big Medicine, which is this campaign's fiscal sponsor and a 501(c)(3). Please send your donation to Big Medicine, PO Box 13, Kennebunkport, ME 04046; and specify "for Maine Progressive Media Fund" somewhere on the check. We would first like to express our sincere gratitude to MPR for the quality of programming you have offered the people of Maine since your inception. Many of us now greatly rely upon you for keeping us informed and educated on issues of deep public concern. Considering that reliance and the increasingly threatening world we all face today, we are also writing to ask you to expand the scope of your endeavors. Specifically, we would like to request more diversity in the range of voices and information you offer, a diversity we now desperately require to understand our current plight and options. Our apparently imminent war with Iraq, our increasing involvement in Columbia, the terrorist menace, our precarious economy, threats to our civil liberties, and other issues are all causes for legitimate concern and demand open intelligent debate. Against this background, we feel the need for more varied perspectives and in-depth reporting on the fateful events now occurring domestically and throughout the world. We believe the quickest, least costly and most effective way to accomplish this would be to include the Pacifica network's Democracy Now! show in your broadcast lineup. Those who live in the Bangor and Blue Hill areas are able to enjoy DN! on WERU, but we believe the rest of Maine now also deserves and needs to hear this extraordinary program as well. Although many journalism schools still teach that one of the profession's highest callings is "to monitor the centers of power," we find that Democracy Now! is one of the rare programs today that puts this ideal into practice. The DN! staff has won wide professional recognition for their courageous coverage and investigations, including the George Polk Award for Journalism, the Robert F. Kennedy Prize for International Reporting, the Alfred I. DuPont-Columbia Silver Baton, the Armstrong Award, and the Radio/Television News Directors Award, as well as awards from AP, UPI, and the Corporation for Public Broadcasting. Democracy Now! not only enjoys critical acclaim, 120 stations now carry the show across the country and all agree that it has developed a broad and devoted audience. We would be proud to have MPR join that list, and sincerely believe the program will boost the network's audience, membership, and reputation in Maine civil society. This request is submitted on behalf of a variety of religious, political, environmental, labor, educational, and peace groups from across the State, and the list of supporting individuals and organizations swiftly continues to grow. We look forward to your positive response to this appeal and to your continued leadership in providing Maine's people with the range of news and views we so urgently need to inform ourselves, comprehend our times, and preserve our own democracy here and now. For a printable copy of this section, click here. "I love Democracy Now! because it enables me to hear important voices, ideas and points of view that I am not hearing anywhere else in the clutter and fog of Washington's chattering classes. Keep up the good work, Amy. I only regret that cannot hear it in every city to which I travel. Amid all the information I absorb ravenously every day, Democracy Now! helps to give me some needed balance." "I am a regular listener of Democracy Now! it is stimulating, refreshing and informative!" "Democracy Now! is an excellent, illuminating radio program. I listen to itas often as I can, either early in the morning when i'm working out or later in the morning, driving to the office. Whether the subject is military repression in Indonesia, sweatshop labor around the globe, genetically altered food, the death penalty or a local environmental struggle-- to name just a few subjects that have caught my attention in recent months -- I invariably feel that I am better informed after listening to Democracy Now! "Just wanted to report that the response that we got from our listeners for DN's convention coverage was overwhelmingly positive. During both the Democratic and Republican convention we took dozens of calls from grateful listeners who said they were glued to their radios. Among the highlights for our listeners were Nader on the floor of the GOP convention and the debates in LA over the tactics of the activists. One other item: I don't think it's an exaggeration to say that the combined radio/video coverage that Pacifica pulled off with Free Speech TV was a milestone in alternative media." "In the four years that KZYX has been airing Democracy Now!, it has become an essential part of our news and information programming, providing a complement and balance to the perspectives heard on NPR. Since day one, Democracy Now' has consistently outperformed both Morning Edition and All Things Considered, both during fund drives and in listener loyalty. For many listeners, it is the high point of our broadcast day. We highly recommend adding Democracy Now! to any station looking to expand the reach and scope of their news programming." "Democracy Now! has really helped build our audience during the afternoon news block and it has been very important in our fundraising. The show has been hugely successful. It has brought a whole new audience to KUNM and it has allowed us to diversify our listenership." "The response to Democracy Now over the last six years has been overwhelming. The show raises more money for us than either Morning Edition or All Things Considered. The message from our community is clear - Democracy Now is an essential part of our programming schedule." "Amy Goodman is an extraordinary journalist, in the grand American tradition of Lincoln Steffens, Heywood Broun, I.F. Stone, carrying their brilliant investigative reporting into the new realm of broadcasting. She has become a legendary figure in the field, has reported from some of the most beleaguered and dangerous places in the globe, with impeccable honesty and courage. Her contribution to our culture is unique bringing information and ideas to her listeners which they cannot see in the major media." "When the rest of the world wants to know what the U.S. government is up to, we turn to Noam Chomsky, Edward Said, Howard Zinn, Ed Herman, Amy Goodman... to tell us what's really going on." Democracy Now! To Former Senator Bob Kerrey: Would You Support A War Crimes Tribunal For Your Own Role In Massacring Vietnamese Civilians? Would You Support Barring CIA Recruiters From College Campuses Or Professors Working For The CIA? Iraq Journal: on-the-ground reports from our award-winning producer Jeremy Scahill in Iraq. The reports include snapshots of the lives of ordinary Iraqis and explorations of how a massive US attack will affect civilians. They also include interviews with key players inside Iraq, tours of hospitals and weapons factories, and in-depth analysis, such as how Iraq's oil reserves figure in US government motives. Interviews with the people who are most directly affected by the "War on Terror" in this country, including ex-detainees and family members of detainees. ln-depth analysis and discussion of other breaking stories, with topics ranging from corporate corruption to labor rights, police brutality to sexual abuse to gun violence, globalization to the environment. Some recent guests: former UN weapons inspector Scott Ritter, former UN humanitarian coordinator to Iraq Hans von Sponeck, an African-American whose Pakistani husband was nearly deported and is still imprisoned, Arundhati Roy, Ani DiFranco, filmmaker Michael Moore, former CIA director James Woolsey debating former Attorney General Ramsey Clark, British MP George Galloway, Ralph Nader and Noam Chomsky.